Meursault leads an apparently unremarkable bachelor life in Algiers until he commits a random act of violence. His lack of emotion and failure to show remorse only serve to increase his guilt in the eyes of the law, and challenges the fundamental values of society - a set of rules so binding that any person breaking them is condemned as an outsider. For Meursault, this is an insult to his reason and a betrayal of his hopes; for Camus it encapsulates the absurdity of life. This is one of my favourite novels. I have read it three times; once whilst living in France, once in the original French text, and finally at home in English (which I am ashamed of - there is no way I could manage the entire novel in French any longer, short as it is, and this makes me feel like an absolute imbecile). My thoughts and opinions on the book change each time, and have in fact changed a lot this time. I have seen a lot more in the text than I did in my previous reading, however whether this is down to the last reading being in French or that I have matured in the three years since, I have no idea. This book has stemmed for Camus's philosophy for the absurd. He believed life had no rational meaning to it, that there is absolutely no purpose for our being here, and that the idea of existence being structured was simply absurd. I believe Camus and many other philosophers were given this idea by the horrors of World War II. For these reasons The Outsider is widely described as existential, and I think to an extent it certainly is. However, the idea of existentialism extends far beyond this, and far beyond my comprehension, and I don't believe Camus explores it in a great deal of detail here. Perhaps existentialist is not the best word to describe this novel, although that could be filed away with many of the other unpopular opinions I have. Our narrator, Meursault, is as emotionally detached as he possibly could be. For the first few chapters of the novel, I believed him to suffer from depression, however I don't think this is the case. He is just entirely indifferent to people and events around him, and he is incredibly honest in an uncomfortable way which means he does not hide his indifference. In this way he completely rejects social standards, such as crying over his mother's death, and in doing so renders himself an outsider and a reject. It is interesting to note that during his trial for murder, the fact that he did not grieve over his mother's death was the damning evidence which damaged his reputation above all other facts. This prompted a wave of philosophical debate in my own head; however I will spare you the details. 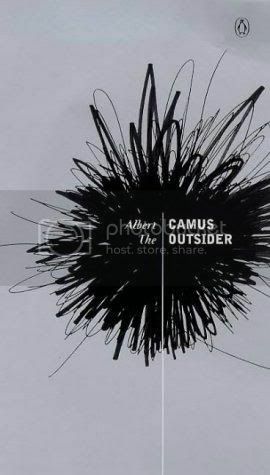 Although this novel works wonderfully well as a literary text, and is in no way a philosophical essay, it also displays Camus's ideas on absurdity and the meaninglessness of life. By absurdity, Camus is referring to the way in which humans attempt to find rational meaning and order in their lives, when there is, and never will be, any at all. For example, there is no rational meaning in aspects of this novel, such as the reason for Meursault committing murder. The idea that something like this can happen for no discernible reason and that Meursault did not have a real reason for committing the act, is unsettling to society and so they will attempt to create reason and order to justify actions - Camus's take on absurdity. I find this idea absolutely delicious. A small thing I noticed in this novel hit me in quite a big way. In most of the scenes, Meursault is either being watched by someone, or is watching someone. I think this says a lot about the notion of absurdity as well - always watching, always looking for something tangible to hold on to. This has been more of a philosophical observation than a book review; I'm sorry. It really is a wonderful little novel, although I'm not sure whether it would be more enjoyable if you're not looking for existentialist and nihilist commentary, resulting in strange thoughts enveloping your brain. It's very short, though enjoyable, and the short sentences are very akin to our narrator's personality. I'd definitely recommend this, and I will be gearing myself up to read this in French again at some point in future. 47 / 72 books. 65% done!